Hound & Gatos cat food is described as a “carnivore’s diet in a can”. The brand’s meat-based recipes are modeled on a feline paleolithic diet and have some of the lowest plant inclusions of any brand in the industry. But is Hound & Gatos a safe, healthy choice for the carnivore in your life? Find out in our unbiased Hound & Gatos cat food review. We’ve analyzed Hound & Gatos and graded it according to the We’re All About Cats standard, evaluating the brand on species-appropriateness, ingredient quality, product variety, price, customer experience, and recall history. Here’s how it rates in each of those six key areas. We give Hound & Gatos cat food a 48 out of 60 rating or an A- grade. Hound & Gatos founder Will Post believes that “cats and dogs were created to eat 100 percent meat – just like in the wild.” That belief is the foundation of Hound & Gatos. Post entered the pet food industry after years watching his pets get sick, live on drugs, and die young. Frustrated by his pets’ poor health, he started researching animal nutrition and developing his own pet food recipes. In 2003, Will Post founded LIFE4K9 Pet Foods, which he sold to Hi-Tek in 2010. Post started Hound & Gatos the same year. In June of 2018, Gott Pet Products, LLC (formerly Charlee Bear Products) announced their acquisition of Hound & Gatos. Gott Pet Products is a Wisconsin-based, family-owned company best known for Charlee Bear natural dog treats. Hound & Gatos cat food is made from US-sourced ingredients, with the exception of lamb, which is imported from New Zealand. The company doesn’t manufacture their own products. Instead, they partner with a manufacturer in the midwestern United States. Has Hound & Gatos cat food been recalled? Never. Hound & Gatos hasn’t had any recalls since its creation in 2010. 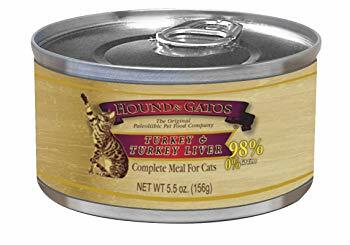 What kinds of cat food does Hound & Gatos offer? Hound & Gatos offers 13 varieties of paté-style canned cat food. All of their formulas follow a paleolithic dietary blueprint and are made with 100% animal protein—no plant protein whatsoever. Their recipes contain meat, water, agar-agar, salmon oil, and synthetic vitamins, minerals, and amino acids. That’s it. They don’t contain any grains, fruits, vegetables, preservatives, or dyes. They’re free of animal by-products, generic liver, carrageenan, guar gum, xanthan gum, and flavor concentrates. Most Hound & Gatos foods are less than 1% carbohydrate on an as-fed basis with agar agar as the sole carbohydrate source. As a soluble fiber, agar-agar doesn’t break down into sugar molecules or raise your cat’s blood sugar. All Hound & Gatos foods are packed in BPA-free cans. Chicken appears to be the primary protein source in this wet cat food. Chicken ingredients account for 100% of this popular recipe’s protein content. Chicken muscle meat and liver are mixed with chicken broth and stabilized with agar-agar. Agar-agar, also known as agar, is a gelatinous red algae derivative with thickening and stabilizing properties. While agar is similar to carrageenan in function and sourcing, it’s not associated with any health risks. Compared to other binding gums, including xanthan, cassia, guar, and locust bean gum, agar-agar is one of the safest natural binders available. To replace nutrients lost during heat processing, the food is fortified with synthetic vitamins, minerals, and amino acids. It contains salmon oil as a species-appropriate source of omega-3 fatty acids. These fatty acids have anti-inflammatory properties and help to keep your cat’s skin supple and their coat soft. Overall, Hound & Gatos Chicken & Chicken Liver Formula is a meat-based food with high protein content, moderate fat content, and almost no carbohydrate matter. There are 201 calories in each 5.5 oz can or 37 calories per ounce. Chicken, Chicken Broth, Chicken Liver, Calcium Carbonate, Agar-Agar, Potassium Chloride, Choline Chloride, Salt, Taurine, Salmon Oil, Iron Proteinate, Zinc Proteinate, Manganese Proteinate, Copper Proteinate, Magnesium Proteinate, Sodium Selenite, Calcium Iodate, Thiamine Mononitrate, Niacin Supplement, Vitamin E Supplement, Calcium Pantothenate, Pyridoxine Hydrochloride, Riboflavin Supplement, Biotin, Vitamin A Supplement, Vitamin B12 Supplement, Vitamin D3 Supplement, Folic Acid. Lamb appears to be the primary protein source in this wet cat food. Because lamb is uncommon in cat food, this recipe is popular among cats with food intolerances and allergies. The paté is made from lamb and lamb liver in a lamb broth. Like all Hound & Gatos recipes, agar-agar is the food’s only binder and carbohydrate source. Agar is not a digestible carbohydrate source. Instead, it’s a soluble fiber and won’t break down into sugar. As a derivative of red algae, agar-agar is similar to carrageenan but has no known negative health effects. The food contains salmon oil, a healthy type of animal-sourced fat. It’s rich in omega-3 fatty acids, which support skin and coat health and reduce inflammation. The food is fortified with a range of vitamins, minerals, and amino acids that make it nutritionally complete and balanced according to AAFCO standards. Overall, Hound & Gatos Lamb Formula is a meat-based food with high protein content, moderate-to-high fat content, and almost no carbohydrates. It has 187 calories in each 5.5 oz can or 34 calories per ounce. Lamb, Lamb Broth, Lamb Liver, Agar-Agar, Calcium Carbonate, Potassium Chloride, Choline Chloride, Tricalcium Phosphate, Salmon Oil, Taurine, Salt, Iron Proteinate, Zinc Proteinate, Manganese Proteinate, Copper Proteinate, Magnesium Proteinate, Sodium Selenite, Calcium Iodate, Thiamine Mononitrate, Niacin Supplement, Vitamin E Supplement, Calcium Pantothenate, Pyridoxine Hydrochloride, Riboflavin Supplement, Biotin, Vitamin A Supplement, Vitamin B12 Supplement, Vitamin B12 Supplement, Vitamin D3 Supplement, Folic Acid. Turkey appears to be the primary protein source in this wet cat food. This paté features turkey and turkey liver as its sole sources of protein. The meat, liver, and broth are stabilized with agar-agar, an apparently safe thickener and binding agent. Agar-agar is the food’s only source of fiber. To replace nutrients lost through cooking, the food is fortified with vitamins, minerals, and amino acids. It’s supplemented with salmon oil. This fish oil is a source of omega-3 fatty acids, which help minimize inflammation and support skin and coat health. Overall, Hound & Gatos Turkey Formula is a meat-based food that’s rich in protein with high fat content and virtually no carbohydrate matter. It contains 191 calories in each 5.5 oz can or 35 calories per ounce. Turkey, Turkey Broth, Turkey Liver, Calcium Carbonate, Potassium Chloride, Agar-Agar, Choline Chloride, Salmon Oil, Taurine, Salt, Iron Proteinate, Zinc Proteinate, Manganese Proteinate, Copper Proteinate, Magnesium Proteinate, Sodium Selenite, Calcium Iodate, Thiamine Mononitrate, Niacin Supplement, Vitamin E Supplement, Calcium Pantothenate, Pyridoxine Hydrochloride, Riboflavin Supplement, Biotin, Vitamin A Supplement, Vitamin B12 Supplement, Vitamin D3 Supplement, Folic Acid. What do customers think of Hound & Gatos cat food? While both happy and unhappy customers respect the brand’s commitment to a paleolithic dietary model, some say that their cats didn’t enjoy Hound & Gatos foods or that the foods had a strange texture. Several say the food was covered in a gelatinous substance—presumably thickened broth. How much does Hound & Gatos cat food cost? Hound & Gatos cat food is more expensive than most of the products you’ll find at the grocery store, but low-cost compared to similar foods with named meats, low plant content, and no artificial additives. If you follow Hound & Gatos’ feeding instructions for a 10-lb cat, the food will cost between $2.18 and $3.78 per day. This daily feeding cost is comparable to most Royal Canin foods and some Iams recipes. The brand is significantly cheaper than high-cost brands like NomNomNow, Ziwi Peak, and Lotus. Overall, is Hound & Gatos a good choice? If you’re serious about giving your cat a species-appropriate, low-carbohydrate canned food, Hound & Gatos is a great choice. It’s one of the few brands that combines high meat content with minimal plant inclusions and no artificial ingredients. Because the brand offers a variety of single-protein foods with simple ingredient lists, Hound & Gatos is a good fit for cats with sensitive digestion or food allergies. It’s a winner for diabetic cats who need a low-glycemic diet and those with IBD who can’t stomach anything else. Palatability and variety are the brand’s problem areas. Based on Hound & Gatos customer reviews on Chewy, an estimated 15% of cats refused to eat Hound & Gatos food. 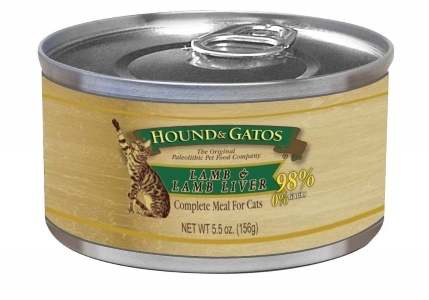 Hound & Gatos is strict about a hydrating all-meat diet, which limits their selection to canned foods. All of their recipes are patés. They don’t offer any alternative textures for cats who prefer shreds or chunks of meat. Where is Hound & Gatos cat food sold? Hound & Gatos is sold at pet specialty retailers. You can request Hound & Gatos at your local store or email the company to find an authorized retailer near you. 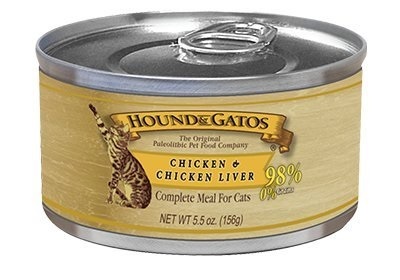 If you’d prefer to shop online, you can find Hound & Gatos cat food on Chewy and Amazon. 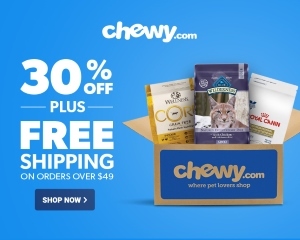 Click here to shop for Hound & Gatos cat food on Chewy.